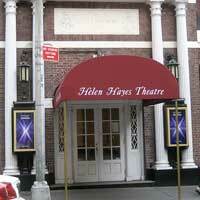 The Helen Hayes Theatre has had a number of names. It opened as the Winthrop Ames in 1912. Later names included the Little, Anne Nichols' Little, Times Hall and finally, in 1983, the Helen Hayes Theatre. Because of its small size, this theatre, now owned and operated Martin Markinson & Donald Tick, has been ideal for intimate shows. Recent tenants: The Smell of the Kill; By Jeeves; George Gershwin Alone; Dirty Blonde; Getting and Spending; Colin Quinn-An Irish Wake; Band in Berlin; Might Must Fall; Epic Proportions; The Last Night of Ballyhoo, (Tony, Best Play); Rob Becker's Defending the Caveman; Joan Rivers in Sally Marr and Her Escorts; Lynn Redgrave's Shakespeare For My Father; Prelude to a Kiss; Artist Descending a Staircase; Romance, Romance; The Nerd; Corpse! ; Harvey Fierstein's Torch Song Trilogy( Tony's Best Play and Best Actor).